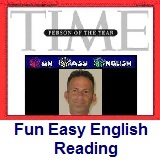 ﻿ Fun Easy English - reading practice and learning about the holiday New Years Day. New Year's Day is observed on January 1, the first day of the year on the modern Gregorian calendar as well as the Julian calendar. In present day, with most countries now using the Gregorian calendar as their de facto calendar, New Year's Day is probably the most celebrated public holiday, often observed with fireworks at the stroke of midnight as the new year starts in each time zone. Mesopotamia (Iraq) created the concept of new year celebration 2000 BC. The Romans dedicated New Year's Day to Janus, the god of gates, doors, and beginnings for whom the first month of the year (January) is also named. After Julius Caesar reformed the calendar in 46 BC and was subsequently murdered, the Roman Senate voted to deify him on the 1st January 42 BC in honor of his life and his institution of the new rationalized calendar. The month originally owes its name to the deity Janus, who had two faces, one looking forward and the other looking backward. This suggests that New Year's celebrations are founded on pagan traditions. In the United States, it is traditional to spend this occasion together with loved ones. A toast is made to the new year, with kisses, fireworks and parties among the customs. It is popular to make a New Year's resolution, although that is optional. In the country's most famous New Year celebration in New York City, the 11,875-pound (5,386-kg), 12-foot-diameter (3.7-m) Times Square Ball located high above One Times Square is lowered starting at 11:59 pm, with a countdown from sixty seconds until one second, when it reaches the bottom of its tower. The arrival of the new year is announced at the stroke of midnight with fireworks, music and a live celebration that is broadcast worldwide. Ah New Year's Day. The perfect day to sleep off a hangover from drinking way too much alcohol the night before. 1. What is the first day of the year on the modern Gregorian calendar? 2. What is often observed at the stroke of midnight at the beginning of the New Year? 3. Which region (country) created the concept of new year celebration around 2000 BC? 4. To whom did the Romans dedicate New Year's Day? 5. When did Julius Caesar reform the calendar? 6. The deity Janus had two of which of the following? 7. In the United States it is traditional to spend this occasion with whom? 8. In the United States a toast is made to the new year including all but one of the following? 9. In which United States city is the most famous New Year celebration held? 10. What is dropped in Times Square on New Years?